Bricks 4 Kidz® After-School Classes build on the universal popularity of LEGO®Bricks to deliver high quality, educational play. Every class is a fun, enriching experience for your child, building new projects each week based on a variety of themes, using the classic bricks loved by generations of children. Our trained, screened Bricks 4 Kidz® teachers lead a discussion related to that day’s model. Instructional content is multi-disciplinary and designed by educators to increase the student’s general knowledge and introduces STEM (science, technology, engineering and maths) concepts related to the day’s model. Lessons are designed around students’ interest, with themes such as animals, space, transportation and sports. Kids will learn about everything from gears, torque and friction, to robotics, space exploration, movie-making and MORE! In these fun, educational classes, students will experience hand-on engineering fundamentals as they build motorised models using LEGO®Bricks. 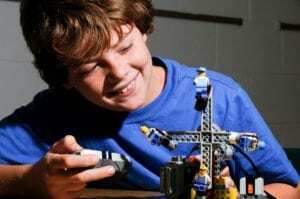 Students use LEGO® We Do 2.0 programming software to bring to life the models they build, based upon Bricks 4 Kidz ® model plans and LEGO®educational products. Building on the Jr. Robotic programme, Bricks 4 Kidz ® utilised LEGO® EV3 Mindstorm technology with unique robot models. Children are introduced to the graphic programming language, equipping them to succeed in a technology-driven marketplace.